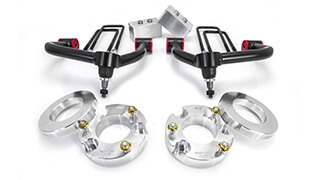 Chevy/GMC 1500 6-lug - Max Lift: 2.25" - Max Tire Dia 33"
ReadyLIFT is proud to introduce a new, stylish line of leveling kits for 2007-2013 Chevy Silverado 1500 and GMC Sierra 1500 6-lug 2WD & 4WD truck owners. 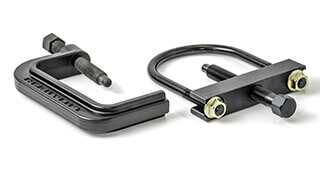 This kit WILL NOT work on the new 2014-UP GM 1500 pickup trucks. 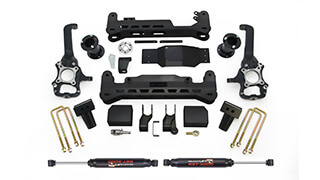 The T6 Billet by ReadyLIFT is the perfect combination of style, form and function while providing the right level stance Chevy Silverado and GMC Sierra truck owners want. 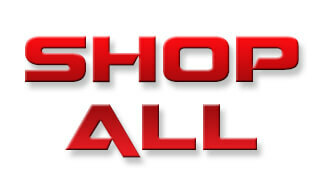 ReadyLIFT T6 Billet Suspension leveling kits are made using only premium 6061 T6 aircraft billet Aluminum. 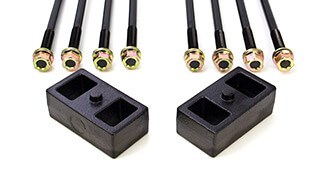 The T6 3085 2007-2013 GM 1500 truck 2WD/4WD strut extension leveling kit is available in black tough anodized finishes with the name of the leading leveling and lift kit manufacturer, ReadyLIFT, laser etched onto the side. The T6-3085 gives GM 1500 truck owners the option to have a great, solid performing leveling kit that comes in different colors that can visibly be seen once installed. 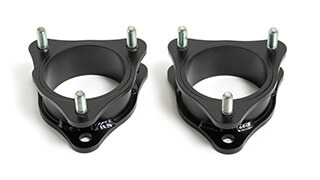 ReadyLIFT designed the T6-3085 2007-2013 Chevy Silverado 1500 2WD/4WD 2.25" leveling kit specifically to provide the right level stance. Why 2.25 inches? Because that is the required amount of front lift necessary to level the 2007-2011 GM 1500 trucks. 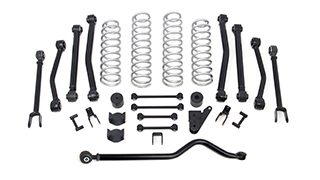 The T6-3085 Leveling Kit installs directly onto the factory strut assembly which maintains the factory ride while enhancing ground clearance. This design is an innovative and revolutionary concept. ReadyLIFT engineers have developed a truly unique masterpiece that truly is a "strut extension". 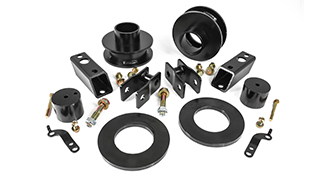 Unlike traditional strut extension kits which bolt to the top of the strut, the T6-3085 kit becomes the upper strut assembly. How is this done? The T6-3085 is a two-piece assembly that becomes one. The lower section has been meticulously crafted to replace the stamped steel upper strut hat. 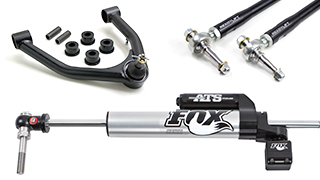 The stronger CNC billet Aluminum section provides firm support for the strut shaft and bushing. Once the new upper spring hat has been installed, the upper and lower sections are then bolted together using tough 10mm hardened bolts for a perfect fit. The T6-3085 and strut and spring become one. We are simply replacing the top of the strut with a stronger, longer assembly that will maintain the factory ride while lifting the front 2.25". This lift also allows the 2007-2013 Chevy Silverado 1500 2WD/4WD owner to install up to 33" tall off road tires without concern for clearance issues. ReadyLIFT T6 Billet coil spring spacers will maintain a smooth OEM ride without adding pressure to stock suspension components, guaranteed! 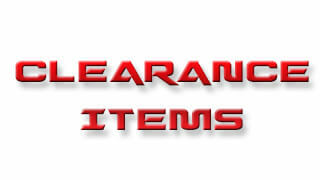 Installation is simple and requires no cutting or modification of factory installed parts. While other kits cost thousands to buy and hours to install, ReadyLIFT® can be installed a few hours and costs less than the price of a single custom wheel. 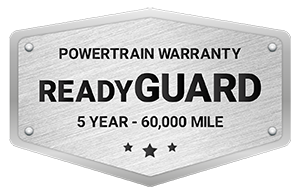 All ReadyLIFT products are backed by a lifetime warranty for as long as you own your vehicle and includes all necessary parts, hardware, and detailed installation instructions. 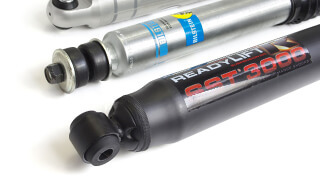 NOTE: Trucks equipped with factory option Rancho struts may have to replace the strut with the OEM version. 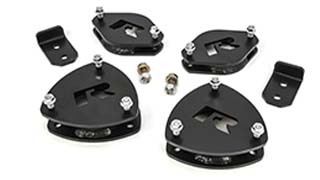 Unique strut top hat replacement design upper strut extensions with new hardware.